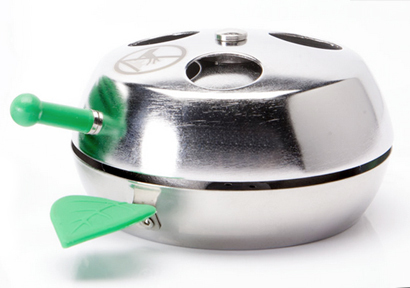 Apple On Top Provost is a Heat Management Device that is designed and engineered to regulate the transfer of heat from charcoal to hookah tobacco. The Apple On Top Provost Heat Management Device also works to significantly reduce the ash, ultra-fine particles, and volatile gasses that pass from charcoal into the hookah Pipe, while reducing your charcoal consumption per bowl. The Apple On Top Provost makes the clouds produced by the Hookah noticeably smoother, cleaner, and more flavorful, while also considerably extending the life of a Hookah session. The Apple On Top Provost Heat Management System prevents a significant amount of ash, ultra-fine particles, and volatile gasses from passing through from the charcoal into the clouds a Hookah user inhales. In doing so, the Apple On Top Provost actually makes the Hookah clouds smoother, cleaner, and more flavorful. It also has the added benefit of extending the life of a Hookah smoking session, so you and your friends can spend more time bonding and less time fussing with changing heads and managing charcoal. Apple On Top Provost is easy to use. Actually, it's beyond easy to use. 1) Fill your Hookah Bowl with Hookah Tobacco. 2) Place Apple On Top Provost directly on the top of the Hookah Bowl (No Hookah Foil is ever necessary and you may use most types of Hookah Bowls in the market, including the Apple On Top Bowl). 3) Put Hookah Charcoal in Apple On Top Provost. 4) Put the Apple On Top Provost lid on the top. 5) Enjoy and experience the difference.